This council is for the fleet safety professional who wants to improve their safety management skills, stay current on new regulations and trends, network with other safety professionals in the trucking industry, and promote highway safety and sharing the roads. 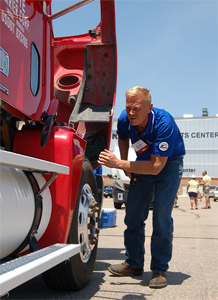 A competitor performs a pre-trip inspection during the annual truck driving championships. 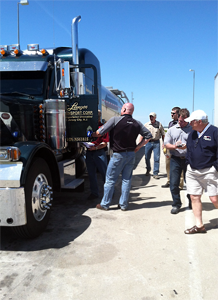 A group of council volunteers conduct courtesy safety inspections for truckers at a scale operated by the Nebraska State Patrol. SMC Lunch & Learn: Are You Clearinghouse Ready? Clearinghouse regulations require employers to both query and report information regarding CDL drivers. Motor carrier employers will be required to report to the Clearinghouse specified violations of the DOT drug and alcohol testing program incurred by their current and prospective CDL drivers. Presenter Jennifer Lancaster has been with FMCSA since 2004 where she began her career as a Special Agent with the Nebraska Division. In 2014, she became an Enforcement / New Entrant Program Specialist for the Midwestern Service Center out of Chicago. Click Here for Full Event Details! Future Events – More Information Coming Soon! Fonner Park, Grand Island, NE – Click Here for More Details! NTA Office, 1701 K St, Lincoln NE – Email baude@nebtrucking.com for More Details! Central Community College, Hastings, NE – Click Here for More Details! Sapp Bros Travel Center, 9905 Sapp Bros. Dr., Omaha. – For info, call Jerry Wessel 402-580-8069. Holthus Convention Center, York – Click Here for More Details! Email atilden@nebtrucking.com to receive the SMC communications. Remember to nominate your drivers for Driver of the Month!